The Sumners: Life and Times: "His Name Is NOT Bunnywunny"
"His Name Is NOT Bunnywunny"
Last week, Joshua's school celebrated World Book Day. The kids were asked to dress up as their favorite book character for school and bring in the accompanying book to read in class with his friends. Here is Joshua with his class, holding a bunny and a sign. We went through all his favorite books and characters, but (with only one day's notice) most of the costumes were too hard or he just didn't like my brilliant dress-up ideas. Finally he chose a book that he wanted to take; there weren't many costume options, but who can say no when your kid is that excited about a book? For the last few weeks he has been obsessed with a new book we checked out at the library (thanks Emily for the recommendation): That Rabbit Belongs to Emily Brown. This is the story of an imaginative little girl who takes her bunny, Stanley, on amazing adventures (to the Milky Way, climbing in the Amazon Rain Forest, deep sea diving) all within reach of the kitchen or garden door. During these adventures, there is always a knock (Rat-a-tat-tat) at the door, and who should it be but someone (the army, navy, air force, etc) sent by the queen requesting that Emily give her "bunnywunny ". Emily politely, but firmly, responds, "This bunny is not for sale. And his name is not bunnywunny. Its Stanley." Well, we didn't really want Joshua dressing up like Emily Brown, in her cute patterned dress. Instead, he wore his own clothes and took Abigail's stuffed bunny to school (after convincing her that it was going to come home again). I also made a little sign to put on the bunny (but Joshua wanted to wear it instead) that repeated Emily Brown's statement, "This bunny is not for sale. And his name is not bunnywunny. Its Stanley." 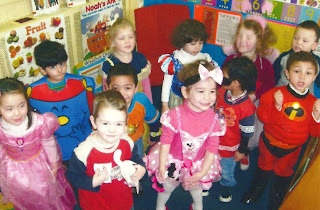 Joshua was quite satisfied with this costume' and enjoyed sharing his book in class with his new friends. And Abigail's bunny, which never had a name before, has now been officially named Stanley. So, I lost my comment- anyway, loved Joshua's costume and his insistence that he wear the sign instead of Stanley. That book still tickles me, esp "Emily Brown was so cross." Oh my goodness! I LOVE this book! I discovered it while nannying a couple of summers ago. I loved the costume that accompanied it as well! I see you do book reviews and beginning a recipe page. I have three blogs; one for reviews(mostly books), one I post just about anything(right now it's basically recipes) and my wordpress blog is up and coming. I like the idea of the kids dressing up. I have three boys (28, 18, 16) and I like the name `Stanley` for the bunny.